All of these donations were printed in Charleston newspapers, and when I first started mapping them I was struck that (1) many of the donors printed in Charleston papers didn’t seem to live in Charleston and (2) how many of them were slaveowners. The new map is here. Quick note: Henry Street, New York, 1847 – a particularly philanthropic street? 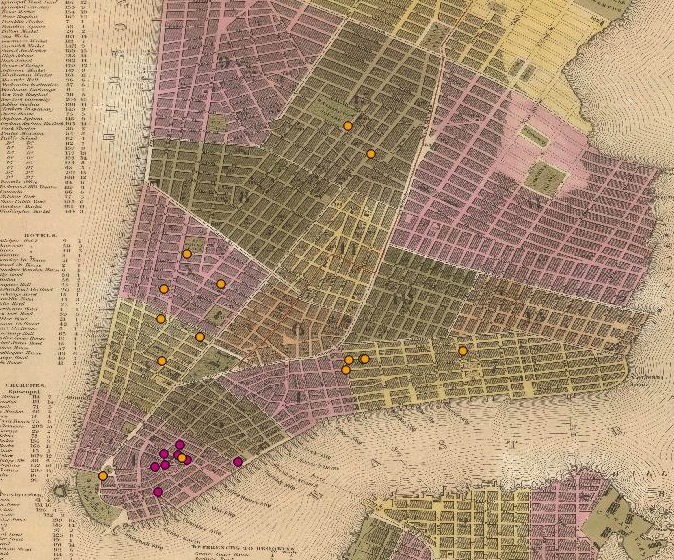 Building on the patterns I’ve been trying to track in famine donors, I also noticed today that of the thirteen individual donors from New York City, nearly a quarter lived within a few blocks on Henry Street. I don’t know what it’s about, or if it’s just a random happenstance but I’ve got a whole other list of NYC donors and I look forward to finding out! I’m deep in the next-year’s-research planning phase of the summer, which is mostly comprised of figuring out what other donor communities I want to look at for the book manuscript. I chose sites for the dissertation largely based on news production – locales in which a lot of news was being produced, reproduced and consumed – but for the book I’ve been thinking about how to better center the experiences of non-elite donors, which means looking for places from which donations flowed, rather than places in which people were merely reading about the famine in Ireland. As part of this, and as part of a related project to collect the names of donors to a wide range of 19th century philanthropic projects, I’ve been working on a database which tracks not only individual donations, but also biographical information about donors. I’ve been using this data – and in particular donations to national famine relief funds (the American Society of Friends rather than the New York Irish relief committee, for example) to try to map places where donations came from, but that I haven’t yet explored. Most of these donations are coming from cities. Many are on behalf of relief committees of entire cities – it’s not clear yet whether these are Quaker relief committees or ones without religious (or with another religious) affiliation, but I hope that’s something I’ll be able to check out at the Haverford Quaker archives. Of those donations made on behalf of urban relief committees, the people doing the collecting were almost entirely merchants. 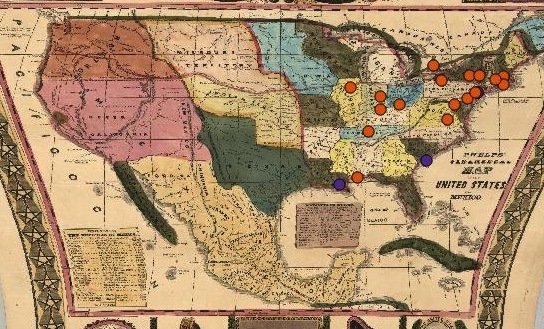 The orange circles are the places I’ve yet to explore – lots to do!